Crank Crank Revolution: Are You Ready For Some...Um, Football? I may not have been a pro sports fan all my life, but I certainly have in the last few years. It's hard not to be when you're born and raised in the Pittsburgh area. And yet, a heretical notion here in Western PA: Football is coming soon, and for the first time in years, I just can't bring myself to get too excited about it. I don't know why. Aside from all of the dramatics produced by the lockout, there isn't anything that has happened that's any different this year than in the past--in fact, if nothing else, the pre-season prospects are brighter. But my interest is alarmingly flat. Not wholly disinterested, of course; I'm going to start watching the games when they come on, and I'll follow as I always have. But in the past, I have actively waited for games to get going. I used to get legitimately excited; I used to watch the moves of our division rivals; and (so help me, so help us all) I would voluntarily listen to sports talk radio. This year, I really couldn't be bothered. It's possible that the Steelers--my team of choice--have just gotten too vulgar for my tastes. Maybe all of the off-field antics and personal justifications I had of Ben Roethlisberger finally caught up with me. Maybe Hines Ward's obnoxious excuses after getting a DUI turned me off of his always-smiling, always-dancing personality. Perhaps the woefully ignorant tweets of people such as Rashard Mendendall embarrassed me. Perhaps the Superbowl loss jerked me back from being spoiled to the drab and unexciting reality of not winning every game that matters. Maybe the statements of key players last year finally changed from noble defiance to outright whining. 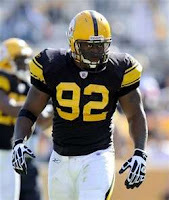 I'm looking at you, James Harrison--wait! No I'm not! I'm not! Get away from me! HELP! Last season, when the theme was Steelers vs. the World and rival players could openly punch our quarterback in the face with no flags in sight, I was openly rooting for the black and gold to demolish our opponents, which they did with alarming regularity. Their trash talk and vague, fine-avoiding potshots at the refs made me want to go spend three hundred bucks on a jersey of someone who would get traded on the off season and still smile about it afterwards. It's the most illogical thing in the world to get so wrapped up in something that has very little to do with your own financial and emotional well-being, but that's hardly something unique to American culture (see also: soccer). I loved it when somehow the players' PR had made it look like the entire football establishment was out to kick the Steelers when they were up, and latched on to every shred of evidence, from borderline calls to fuzzily-interpreted statements by the commissioner, as ironclad proof. Because that is what sports fans do: build up artificial challenges, and then beat them down and declare victory within the confines of their self-created rules. And yet I was invested, just like everyone else in Western Pennsylvania every season, including the lean years (see also: Brister, Bubby). I'm not a fool. I will probably look back at this post in a month or so and laugh. When I see a lot of overpaid crybabies in clown-college uniforms step onto a painted lawn filled with already-drunk jackasses who skipped a mortgage payment to be there, I'll be hooked just like I am every other year. And I'll probably be watching the M&T Bank Stadium the second week of September in eager anticipation of a much-needed division victory. But right now, I'm more interested in the new season of Modern Family than anything the NFL will produce this year. I'm still a burgher, though. Honest!